The Philippine food industry is definitely growing. It’s like each week, a new concept is being put up. We love it! It just means many more options for us! This year will mark the fourth run of The Choice Awards. This annual event that tries to identify the People’s Favorites is a partnership between Our Awesome Planet, the top food blog in the country as well as one of the Top 50 travel blogs in the world; the blogger collective that is the KTG (Kain Tulog Gang); and the World Food Expo (WOFEX). Now it’s your turn to let us know what your CHOICE is. Click here to complete the survey and let us know what your top picks are for 2018! You have until July 30, 2018, Monday to vote! 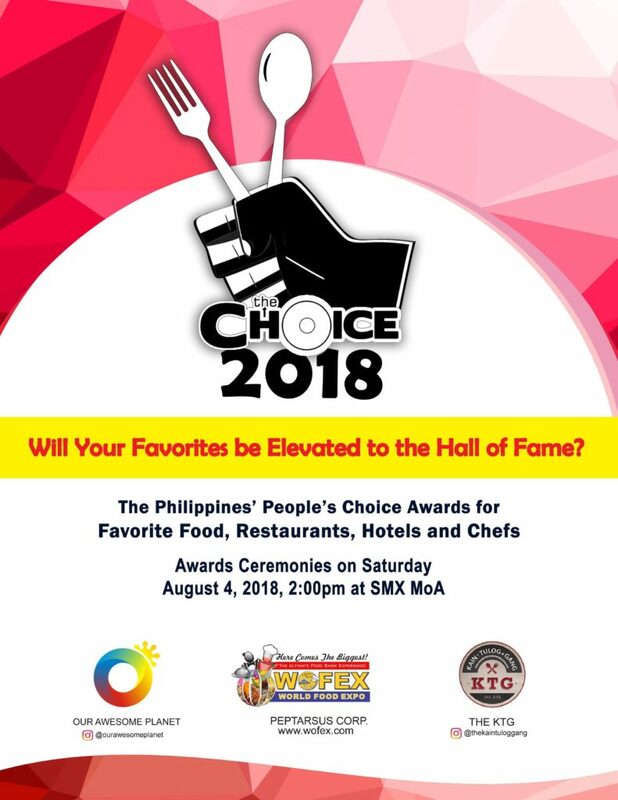 The Awarding Ceremonies will be happen on August 4, 2018, Saturday, at the SMX Mall of Asia.